Yeah, I think it was he took over, he took control [Laughs.] 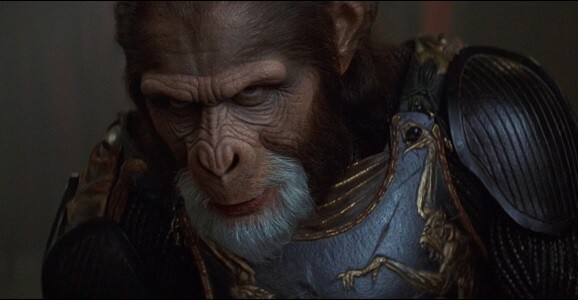 I think the idea was when they shunted in time that way, he was the President of the Planet of the Apes. [Laughs.] Brilliant, I thought. It’s crazy stuff. I liked it. I had a good time making it. It was in the old style. It wasn’t using too much CG trickery. So if we’re all on board here, it seems as though Mark Wahlberg’s Captain Leo Davidson just didn’t go back in time far enough. General Thade apparently went back even further, which allowed him to make the title of the movie a reality in that world. I’d love to read that Ape-mancipation Proclamation. If only this movie had earned a sequel, then we could have watched Roth-in-makeup taking over 19th century Washington D.C. To me, that would have been better than this whole movie. And even if we understand that Thade somehow rocked a presidential campaign that got him in office, that doesn’t justify a thousand cop cars and journalists immediately showing up to the Memorial after Davidson crashes, or why nothing about cops and authority seems to have changed with apes assimilated into the population. Apes in cop uniforms are possibly the dumbest things Burton has put to film. Check that ending out below. It’s especially discouraging given how iconic the original Planet of the Apes ending was. (So iconic, it almost got referenced in the Rise of the Planet of the Apes ending.) Now let’s start a petition to get Roth in the Dawn of the Planet of the Apes sequel.